1. "The contact play is an attacking move"
This is a widespread misunderstanding, although many players are probably not aware of the fact that they play a contact play as an attack. Where does it come from ? Every player will have met this handicap joseki. 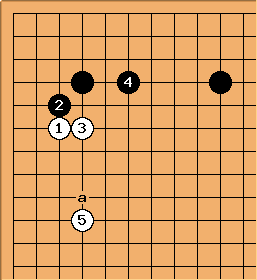 Perhaps it is even the first joseki many players learn. It is said to be the most aggressive response to White's knight's approach. It starts with the contact play at ... No wonder people mistake the contact play for an attacking move ! is a perfect attacking move, in accordance with the proverb. What is then the purpose of ? The contact play forces an answer (see basic instinct). It commits White to invest in his stone and make it twice as valuable. 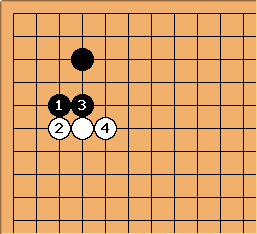 At the same time it denies White the flexibility to jump into the corner and dodge the attack. In other words, makes White heavy. 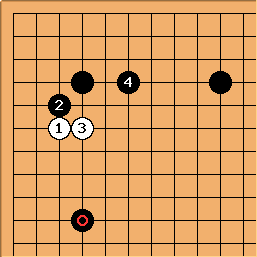 A typical misinterpretation of the contact play occurs when the handicap shifts to 6 or 7 stones and the marked stone of the previous diagram is not present. In absence of the attacking stone, makes White strong in an undisputed area. After Black's necessary defense at , White has a perfect extension to or a. Black's corner is not completely invulnerable, now that White has little to worry about on the side. 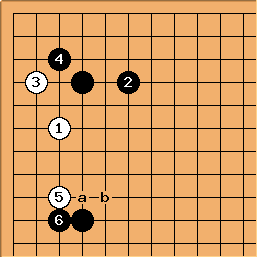 See 4-4 Point Diagonal Attachment Joseki, 3-3 Invasion for some sequences related to the corner vulnerability. If Black omits the defensive move and attacks prematurely at , White strengthens her stones even more and the attack becomes rather futile. It must be added that this kind of conventional wisdom is currently under investigation due to the new development in Korean Baduk. Nowadays is sometimes played (by pros) but then followed up by double hane with at a. The more usual joseki is at , at . 2. "The contact play keeps sente"
Another variant of the mistaken view on the contact play as an aggressive move. Where does it come from ? 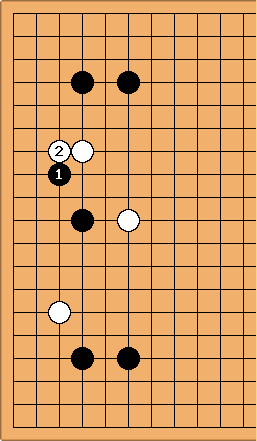 Although Black does keep sente, the blind application of the above joseki moves lead to the infamous bermuda triangle - see that page to read more about this situation. 3. "Permitting the hane at the head is quite all right"
Everybody who has enjoyed a brief exposure to shape or technique knows that it is favourable to hane at the head. 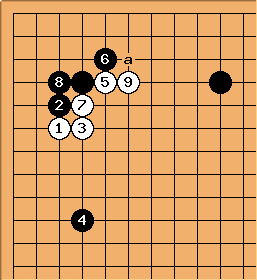 Still a lot of players (including me) continue to move their own stones in the hane'd position. Where does it come from ? The avalanche joseki is food for more experienced and adventurous players. The result will usually trade White influence for Black territory. It is beyond me to understand the avalanche joseki, but facts are that even though this shape is usually very unfavourable for White, it is playable in this position. Klaus: Maybe, this shape should be called "hane at the bottom of two stones". The fact that the Black stone is not on the outside makes the situation playable. Dieter: I think it is rather the specifics of the corner which make it playable. This is not such a common mistake, maybe, but it is surely a case where Black's hane is extremely advantageous. Lynx: This is shape is sometimes playable, but usually not in the midst of such enemy strength. If the colors were switched, then this shape could happen, as seen in the latest Meijin title. Dieter: It is definitely possible to find such shapes in pro games. These are however exceptional and due to a specific purpose. In general, allowing hane at the head is bad. The angle play is one of those moves that I'd like to see disappear from my club members' games because I seldom feel it gives a good result. Where does it come from ? xela: the angle play is advocated in the book Attack and Defense as a good attacking move. I think the bad habits below are examples of using the angle play for defence rather than attack. There are probably other sources for this bad habit, but part of it may be written on the account of this joseki. This is many a player's standard opening in a 9H game. The angle play of Black 1 only makes his position worse, both in terms of shape and encirclement. 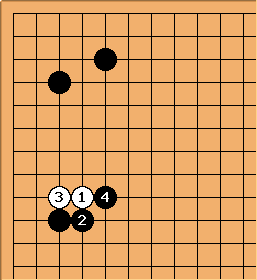 This set pattern is almost imperative to some players. 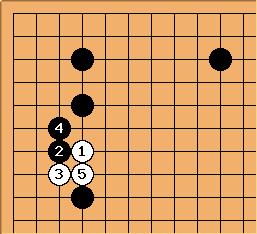 So, when entering Black's sphere of influence, they will play without second thoughts and with a blatant neglect of technique. Black's answer at is too good to be true. 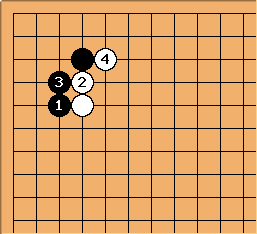 White hasn't stabilized at all and has to add another move. 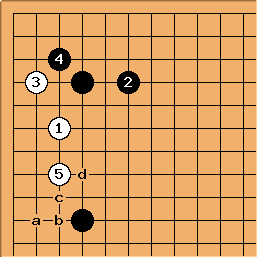 If next White a, Black will hane at the head with b. 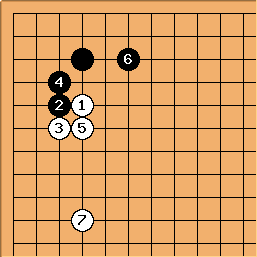 When entering Black's sphere of influence, restraining to here is much better as it doesn't play the tantalizing angle play. Many will perceive this as cramped because they know the theory about extension from a wall. But technique gets priority. 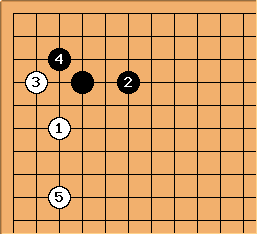 If Black doesn't answer, White can slide to a, stabilizing her group and laying waste to a fair portion of Black territory (if any). If Black answers, his answer will not nearly be as severe: Black b will be the proper shape. The diagonal attachment of c will reinforce White rather than Black. Charles Matthews I see that at d is just as common, in pro games. This doesn't affect Dieter's point, of course.